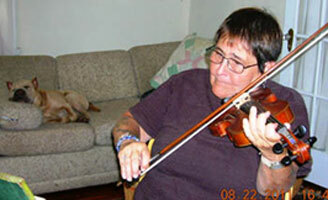 Professor Burgin playing for her young canine companion, Darya Samsonovna (Dasha). The creative and scholarly writing of Professor Diana Lewis Burgin of U‑Mass/Boston, including the first English publication of her most recent book, Five Hard Pieces, and work in Russian gender studies. Original verse translations of selected poems by Marina Tsvetaeva, Sophia Parnok and other Russian writers. Historic photographs and other musical memorabilia from the archives of American virtuoso violinist, Ruth Posselt, and former concertmaster and associate conductor of the Boston Symphony Orchestra, Richard Burgin. Copyright © 2007 Diana Lewis Burgin. All Rights Reserved. Please credit when quoting.